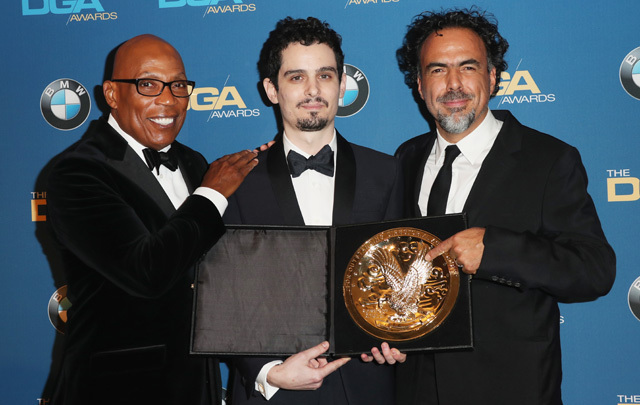 The winners of the Directors Guild of America Outstanding Directorial Achievement Awards for 2016 were announced on Saturday during the 69th Annual DGA Awards at the Beverly Hilton in Beverly Hills. Damien Chazelle won the DGA’s Award for Outstanding Directorial Achievement in Feature Film for La La Land. Actor Jane Lynch hosted the ceremony before an audience of more than 1,200 guests. Presenters included (in alphabetical order): Amy Adams, Michael Apted, Casey Affleck, Paris Barclay, Martha Coolidge, Laverne Cox, Billy Crudup, Michael Fassbender, America Ferrera, Cuba Gooding Jr., Ryan Gosling, Taylor Hackford, Tony Hale, Alex R. Hibbert, Gale Anne Hurd, Alejandro G. Iñárritu, Nicole Kidman, Christine Lahti, Helen Mirren, Mandy Moore, Kevin Nealon, Christopher Nolan, Sarah Paulson, Gene Reynolds, Trevante Rhodes, Ashton Sanders, John Singleton, Emma Stone, Milo Ventimiglia, and Kerry Washington. You can view the full list on nominees for the 69th Annual DGA Awards by clicking here.